I can not reproduce this problem. I can log in with all browsers, but some users not.. Which version of Askbot do you run? Did you make any custom modifications on the code? 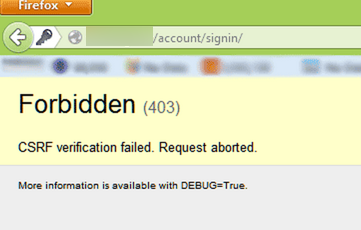 Did you already try `DEBUG=True` as the message suggests? My version is 0.7.48. The Problem is that I don't get this message, but some of my users. I got this too on http://askbot.org, but I didn't try with NoScript disabled. Askbot is based on django, which features explicit CSRF protection. Please read djangos documentation on that topic and have a look at the askbot source code corresponding to your installed version of askbot. Also try to set DEBUG=True in your settings.py and try to trigger that situation from one of the affected browsers afterwards.